Our most trusted all terrain snowboard, the Team Gullwing version, offers an effortless and forgiving ride for all styles in any condition or terrain. Adding the playful, forgiving, and reliable Gullwing Rocker to this legendary Directional Twin snowboard allows anyone to turn their local mountain into the ultimate personal playground. Stacked with the same technology as the standard team, but designed to provide the perfect blend of response and forgiveness for effortless progression and “surf like” feel no matter the conditions. 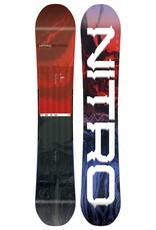 The standard camber strategically placed under the feet provides the pop and response you need for unparalleled control, while the reverse camber between the bindings offers the most amazing flex and float for presses and pow days.